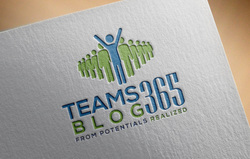 This is one of eight online learning modules for team leaders (current, new and aspiring), part of the Teams365 series offered from Jennifer Britton and Potentials Realized. 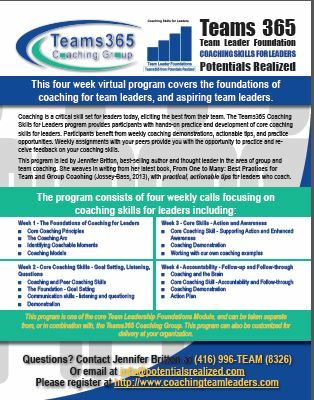 This four week virtual program covers the foundations of coaching for team leaders, and aspiring team leaders. Download a program brochure here. Coaching is a critical skill set for leaders today, eliciting the best from their team. The Teams365 Coaching Skills for Leaders program provides participants with hands-on practice and development of core coaching skills for leaders. Participants benefit from weekly coaching demonstrations, actionable tips, and practice opportunities. Weekly assignments with your peers provide you with the opportunity to practice and receive feedback on your coaching skills. This program is led by Jennifer Britton, best-selling author and thought leader in the area of group and team coaching. She weaves in writing from her latest book, From One to Many: Best Practices for Team and Group Coaching (Jossey-Bass, 2013), with practical, actionable tips for leaders who coach. This program is one of the core Team Leadership Foundations Modules, and can be taken separate from, or in combination with, the Teams365 Coaching Group. This program can also be customized for delivery at your organization. It is a small group learning experience and group size is capped at 12.